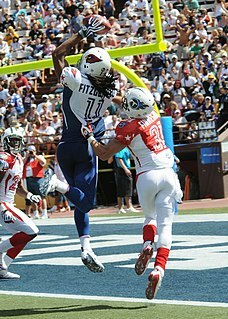 The tight end (TE) is a position in American football, arena football, and formerly Canadian football, on the offense. The tight end is often seen as a hybrid position with the characteristics and roles of both an offensive lineman and a wide receiver. Like offensive linemen, they are usually lined up on the offensive line and are large enough to be effective blockers. On the other hand, unlike offensive linemen, they are eligible receivers adept enough to warrant a defense's attention when running pass patterns. 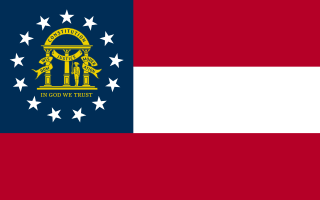 Peach County High School is a public high school located in Fort Valley, Georgia, United States. The school is part of the Peach County School District, which serves Peach County. The Detroit Lions are a professional American football team based in Detroit, Michigan. The Lions compete in the National Football League (NFL) as a member club of the league's National Football Conference (NFC) North division. The team plays its home games at Ford Field in Downtown Detroit. A touchdown is a scoring play in both American and Canadian football. Whether running, passing, returning a kickoff or punt, or recovering a turnover, a team scores a touchdown by advancing the ball into the opponent's end zone. Jay Brian Fiedler is a former American football quarterback in the National Football League (NFL). He played 76 games at quarterback in the NFL, 60 of them as a starter, and threw 69 touchdowns. He was inducted into the National Jewish Museum Sports Hall of Fame. On March 8, 2007, the St. Louis Rams signed McMichael to a three-year, $11 million deal that includes a $3 million signing bonus. The deal reunited McMichael with Scott Linehan, the Dolphins' 2005 offensive coordinator and then head coach of the Rams. McMichael suffered a season-ending right tibia injury against Buffalo on September 8, 2008, and missed the rest of the 2008 NFL season, after posting 11 catches for 139 yards. The 2009 NFL season he played all 16 games, finishing with 34 c atches for 332 yards and 1 touchdown. Christopher J. Chambers is a former American football wide receiver who played ten seasons in the National Football League (NFL). He played college football for the University of Wisconsin. He was drafted by the Miami Dolphins in the second round of the 2001 NFL Draft, and also played for the San Diego Chargers and Kansas City Chiefs. Christopher Jason Witten is an American football tight end for the Dallas Cowboys of the National Football League (NFL). And sports broadcaster. He played college football for the University of Tennessee, and was drafted by the Dallas Cowboys in the third round of the 2003 NFL Draft. His 40 yard dash time is a 5.7. Witten ranks second in all-time career receptions and receiving yards by an NFL tight end, trailing only Tony Gonzalez. Initially retiring in 2018, he became a color analyst for ESPN's Monday Night Football. Marty Montez Booker is a former American football wide receiver who played for eleven seasons in the National Football League (NFL). After playing college football for Louisiana-Monroe, he was drafted by the Chicago Bears in the third round of the 1999 NFL Draft. During his first tenure with the Bears, he earned a Pro Bowl selection in 2002. He also played for the Miami Dolphins from 2004 to 2007, Bears in 2008, and Atlanta Falcons in 2009. Earl Heath Miller Jr. is a former American football tight end who played professionally for the Pittsburgh Steelers of the National Football League (NFL) for 11 seasons from 2005 to 2015. Miller played college football for the University of Virginia, where he earned All-American honors and won the John Mackey Award. The Steelers selected him in the first round with the 30th overall pick of the 2005 NFL Draft. Benjamin Watson is a former American football tight end. 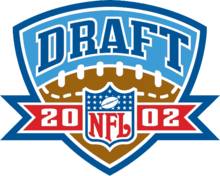 He was drafted by the New England Patriots 32nd overall in the 2004 NFL Draft and later he would win Super Bowl XXXIX with the team over the Philadelphia Eagles. He played college football at Georgia. Watson has also played for the Cleveland Browns, Baltimore Ravens and New Orleans Saints. Anthony G. Becht is a former American football tight end who played in the National Football League. He was drafted by the New York Jets 27th overall in the 2000 NFL Draft. He played college football at West Virginia. He was also a member of the Tampa Bay Buccaneers, St. Louis Rams, Arizona Cardinals and Kansas City Chiefs. Robert Theodore Trumpy Jr. is a former professional American football tight end who played for the Cincinnati Bengals from 1968 through 1977. He was a two-time National Football League Pro Bowler and a two-time American Football League All-Star. Following his playing career he spent many years as a broadcast color analyst, broadcasting four Super Bowls. He was given the Pete Rozelle Award for broadcasting from the Pro Football Hall of Fame in 2014. Harold Leon Jackson is a former American football wide receiver who played in the National Football League from 1968 through 1983. Jackson was drafted in the 12th round of the 1968 NFL Draft by the Los Angeles Rams. In 2014, Jackson was hired to serve as head coach at his alma mater Jackson State. He was fired five games into the 2015 season. Burnell Michael "Mike" Wallace III is an American football wide receiver who is currently a free agent. He played college football for Ole Miss, and was drafted by the Pittsburgh Steelers in the third round, 84th overall of the 2009 NFL Draft. He has also played for the Miami Dolphins, Minnesota Vikings and Baltimore Ravens. Throughout his career, Wallace has been known for his speed after finishing with a time of 4.33-seconds in the 40-yard dash at the NFL Scouting Combine. Robert James Gronkowski, nicknamed "Gronk", is an American football tight end for the New England Patriots of the National Football League (NFL). Michael Patrick Hoomanawanui is an American football tight end of Hawaiian and Italian-Irish descent who is currently a free agent. He was drafted by the St. Louis Rams in the fifth round of the 2010 NFL Draft. He played college football at University of Illinois. Charles Clay is an American football tight end for the Arizona Cardinals of the National Football League (NFL). He played college football at Tulsa and was drafted by the Miami Dolphins in the sixth round of the 2011 NFL Draft. He has also played for the Buffalo Bills. Ladarius Green is a former American football tight end. He played college football at Louisiana–Lafayette and was drafted by the San Diego Chargers in the fourth round of the 2012 NFL Draft. Jace Jordan Amaro is an American football tight end who is currently a free agent. He was drafted by the New York Jets in the second round of the 2014 NFL Draft. He played college football at Texas Tech. Amaro is of Mexican descent. Dion Sims is an American football tight end who is currently a free agent. He was drafted by the Miami Dolphins in the fourth round of the 2013 NFL Draft. He played college football at Michigan State. Gavin Escobar is an American football tight end who is currently playing for the San Diego Fleet of the Alliance of American Football (AAF). He was drafted by the Dallas Cowboys in the second round of the 2013 NFL Draft and played college football at San Diego State University. Vance Coman McDonald is an American football tight end for the Pittsburgh Steelers of the National Football League (NFL). He was drafted by the San Francisco 49ers in the second round of the 2013 NFL Draft. He played college football at Rice. Travis Michael Kelce is an American football tight end for the Kansas City Chiefs of the National Football League (NFL). He was drafted by the Chiefs in the third round of the 2013 NFL Draft. He played college football at the University of Cincinnati. He is a four-time Pro Bowler, two-time All-Pro, and was ranked 26th by his fellow players, and second among tight ends, on the NFL Top 100 Players of 2017. Kelvin Benjamin is an American football wide receiver who is currently a free agent. He played college football at Florida State and was drafted by the Carolina Panthers in the first round of the 2014 NFL Draft. He has also played for the Buffalo Bills. Jesse Dylan James is an American football tight end for the Detroit Lions of the National Football League (NFL). He played college football at Penn State, and was drafted by the Pittsburgh Steelers in the fifth round of the 2015 NFL Draft. ↑ Sentell, Jeff (October 22, 2015). "Throwback: UGA's Randy McMichael went from no stars to the NFL". DawgNation. 1 2 Kraczkowski, Kevin (March 3, 2012). "Miami Dolphins All-Time Top 100 Players: 74. Randy McMichael". The Phinsider. SB Nation. Retrieved March 2, 2019. ↑ "Rams agree with ex-Fin McMichael". ESPN.com. March 9, 2007. ↑ "Miami Dolphins Career Receiving Leaders". Pro-Football-Reference.com. Retrieved 2019-03-02.